Posted by Sam Smith on Thursday, February 7th, 2013 at 4:04pm. Many of our beach towns in Southern California run together and it's sometimes hard to know where one beach town ends and another one begins. Newport Beach is unique as it has clear distinguishing landmarks that separate Laguna Beach to the south and Huntington Beach to the north. To the south, the Crystal Cove state beach area where you will only find the sandy beach and a preserved wildlife area is the last thing you will see before you enter the community of Laguna Beach. To the north, the beachfront homes between Newport & Huntington Beach are separated by the Santa Ana River the clearly divides the two beach towns. The beachfront homes at the border of the Huntington Beach city line have many unique advantages to them. For starters, the area is predominately more private than homes located near the Pier that have more tourist and foot traffic along the boardwalk. You won't see a lot of people on the beach and sand stretches for miles in the remote area. If you are looking for a private and serene location then the north side of Newport Beach is the place for you. 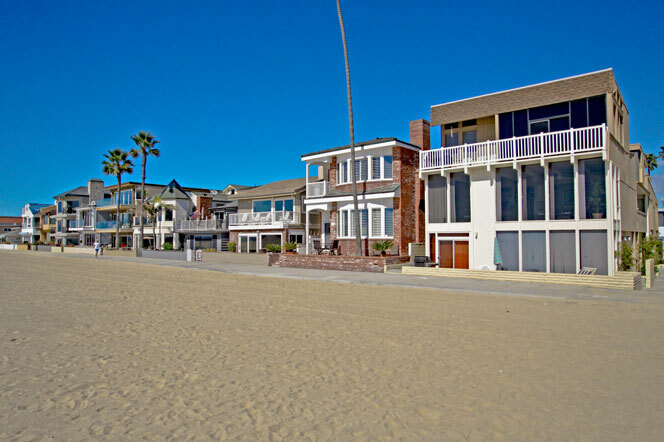 Home prices for beachfront homes is consistent in this area with other beachfront homes near the Newport Beach pier and will start in the mid $2 million dollar range and go as high as $10 million dollars. Huntington Beach will also have a nice selection of beach front homes as well starting the in the $2 million dollar range as well. Beach front rental homes typically will start in the $3,000 a month for a long term rental. If you have any questions regarding these luxury properties please contact us today. We know the Newport Beach Real Estate market well and look forward to assisting you!